Help your backyard birds relax by placing the Heartwood Mango Shady Shed Bird House within your landscaping. The traditional, square body, curved and pitched roof, and soft orange finish make this home a delightful addition to your backyard with ease. Crafted from lasting cypress, the piece will surely look great for many seasons, its weathered, light orange color highlighting your foliage. The verdigris roof, made from aged copper, furthers the home's antique look, and its slightly offset curve brings dynamic shape to your garden. A 1.5" diameter entry hole sits on the front of the shelter for birds to conveniently access it, and a browned copper leaf shape surrounds the opening, creating a fun and functional predator guard. The entry leads to a comfortable roosting spot for your backyard birds, and the cypress body helps the home remain warm for them. Ventilation gaps beneath the roof overhang prevent the nestlings from overheating, and drainage on the base keeps the home dry. The piece attaches easily to a tree, fence, or post using its hanger, or may rest on a level surface for a surprising display. A cleanout panel on the back helps you keep the interior tidy for the next brood. The copper and cypress body will remain beautiful and viable for many seasons, and its distressed, orange tones lend a delightful hint to your yard. 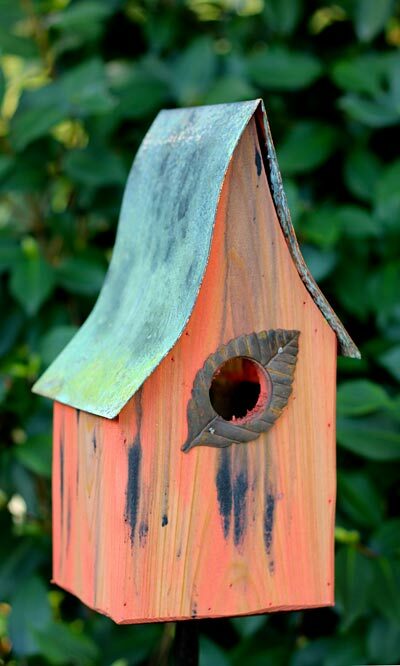 Invite the birds in your area to unwind in this Mango Shady Shed Bird House. Made in the USA. BestNest 4 x 4 Mounting Post, Treated Pine, 95"